Custom Golf Carts Columbia moving sale – Where are we located? Custom Golf Carts Columbia moving sale is happening now at our new location – 519 Chapin Road, Chapin, SC 29036. Come see us during our grand re-opening event to get everything you need for Spring! Custom Golf Carts Columbia’s new location is equipped with a service bay and showroom floor stocked with the newest Husqvarna models and accessories. Our experienced staff understands that our customers are busy people with several commitments. Thus, we take the responsibility of making sure your lawn equipment and carts are always good to go when you’re out for some golf or just cruising the area. We offer the best golf cart service and repair rates in town. We even offer replacement parts and options to customize for most brands! Our new location at 519 Chapin Rd. is equipped to handle double the service load in half the time! Old? New? Refurbished? Our techs can handle anything! Call today at 803-941-7523 or visit us Monday – Saturday during the Custom Golf Carts Columbia moving sale and see what we have to offer! Custom Golf Carts Columbia moving sale – What’s on sale? Custom Golf Carts Columbia moving sale is going on now. What’s on sale? Everything! Custom Golf Carts Columbia offers the lowest prices in town. You won’t find quality from big box retailers. Shop local and receive a personalized experience. Custom Golf Carts Columbia will be there for you for service and repair – even after the sale. 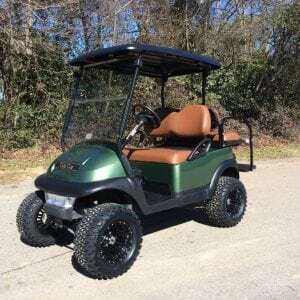 Check out The General Golf Cart below, just one of many styles that you can get for a great deal at the Custom Golf Carts Columbia moving sale going on now located at 519 Chapin Rd! Custom Golf Carts Columbia prides themselves on their 4.3/5 rating on Google. Not only do we strive to offer the best customer service, we hope to exceed it! The Custom Golf Carts Columbia moving sale is the perfect time to experience great customer service for yourself! Come see us at 519 Chapin Rd. today! Robert Bass: “I purchased my cart on Saturday when there was a limited staff. I told Wes (the employee who sold me the cart) I would be back by 3:00 to pick it up. When I ran into problems getting there by 3:00, he stayed even though he had plans right after work.